Your iPhone isn’t capable of the instant diagnosis and treatment of illnesses yet, but in time it may rival the Tricorder of Star Trek fame. Whether you’ve made a New Year’s resolution to lose weight, to keep better track of your kids’ immunization schedule, or to provide more help to your aging parents, there’s a florid universe of apps in 2014 to help you to do it all. Last year, more and more people used devices such as Jawbone UP, Nike Fuel or the FitBit Flex to track their health, fitness and dietary habits. But in 2014 and beyond, mobile health apps are going to expand well beyond that to become, as David Albert, CEO and Founder of San Francisco startup AliveCor puts it: “physician-guided self-management,” systems. Soon, the worried — well quantified-self fans — and the rest of us are increasingly going to be able to collect more kinds of information about ourselves on our mobile devices. Once those daily habits and vitals are tracked, algorithms will be able to make recommendations on actions to take, or they will whisk that data straight back to the doctor for a more informed discussion during a later visit. Already, smartphone owners in the United States and the United Kingdom can produce their own electrocardiograms with AliveCor and send them off for instant analysis. In the coming year, some doctors will be prescribing Type 2 diabetes patients a digital health product that incorporates an app called BlueStar from Baltimore, MD startup WellDoc to manage their conditions. Both products have been examined and cleared for the U.S. market by the Food and Drug Administration. They’ve also been through extensive use and testing in clinical trials. The general hope is that digital technology, wireless sensors and cloud storage can make healthcare management more efficient, reduce costs and shift much of the balance of managing individuals’ health back to the individual from the doctor’s office. While anyone can buy AliveCor’s sensors, access to WellDoc’s BlueStar Type 2 diabetes management product will only be available with a prescription. A half-hour in-person product installation and training session accompanies the prescription. Once installed, the BlueStar software uses the information that’s entered into the system to make personalized recommendations on how users should regulate their blood sugar levels. 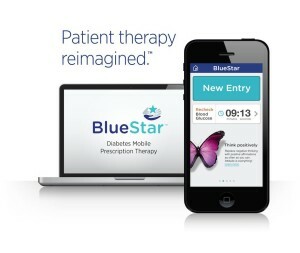 A randomized controlled trial of the WellDoc Bluestar system published in the American Diabetes Association’s journal in 2011 showed that there was a significant two-point reduction in users’ three-month average glucose levels, said Chris Bergstrom, Welldoc’s chief strategy and commercial officer in an interview. That means that the chances of those users’ diabetes getting worse are also significantly reduced. WellDoc’s BlueStar algorithms will coach people with Type 2 Diabetes on how to better manage their conditions. The hope from the medical community is that individuals will use apps not only to keep fit, but to better manage their chronic conditions so that they don’t progress to the next stage. It’s a significant goal both here in the U. S. and globally. The World Health Organization estimates that two thirds of the 55 million people who died in 2011 suffered either from some form of cardiovascular disease, cancer, diabetes or a chronic lung disease. In the U.S. alone, almost 24 million people suffer from diabetes and someone has a heart attack every 34 seconds. For more people than ever before, there’s an increased financial incentive to live healthily: A new Obama administration rule that became effective at the beginning of the year allows employers to either reward employees for meeting certain health-related goals, or to penalize them. The incentives are designed to get people to stop smoking, exercise more, lose weight and maintain certain levels of cholesterol, blood pressure and a healthy body mass index. According to the Pew Research Center, a quarter of adult Americans have high blood pressure, 13 percent have some sort of chronic lung condition such as asthma, bronchitis or emphysema, and 11 percent have diabetes. Employers can now start offering their employees up to a 30 percent discount on their healthcare premiums if they participate in specific programs to help them to achieve their health goals. Two other reasons that we’re likely to see more and more mobile healthcare apps: The Obama administration has been incentivizing healthcare systems to digitize their patient records in order to make doctor-patient interactions between office visits easier, and to encourage patients to manage their own health between visits, says Priyanka Agarwal, an assistant clinical professor of medicine at the University of California School of Medicine in San Francisco. And the Affordable Care Act, aka Obamacare, also encourages the formation of “Accountable Care Organizations,” which will flip the financial incentive system to compensate doctors for keeping their patients healthy, rather than rewarding them for treating patients when they’re in a health crisis. Nevertheless, the potential of the app universe has so far been stymied by the legacy healthcare systems, says Michael Wasser, an independent software developer and co-creator of HealthSherpa, the indie web site that helps people comparison-shop for insurance plans offered through the federal healthcare insurance exchange. That means that it’s hard for third-party developers to build apps that can help family members to easily access and manage information relating to either their kids or elderly parents. A survey of the more than 40,000 healthcare-related apps in the U.S. iTunes store conducted last Fall by the IMS Institute for Healthcare Informatics in Parsippany, New Jersey, found that most apps fall in the diet, exercise and wellness category. Agarwal, for her part, says that we’ll see more usage of healthcare apps once more of them have been clinically tested, like drugs, so that more doctors can start recommending them. The IMS report also notes there are legal liability issues that need to be sorted out, in addition to other questions relating to privacy and security. Calorie Counter and Diet Tracker by MyFitnessPal HD Cost: Free. This is probably the most popular diet and exercise logging app that comes with a huge database of three million different kinds of foods (including ethnic foods like dim sum dishes.) Unlike other apps, if what you’re eating is not in there, it allows you to add it. Once you’ve created a fitness profile and goal, the app establishes a daily food and exercise budget for you. Users can track their food and water intake, log their exercise routine, connect with friends, and track their progress. The advantage of this app is that everything is in one place: it also syncs up to the Jawbone UP system. The problem with using a lot of different exercise and dieting apps is that you have to re-enter the same information over and over again. Quit It 3.0: If you’re still smoking but want to quit, this is a $0.99 cent motivational program that constantly reminds you of how much money you saved, and how much your lungs benefited from not inhaling all those chemicals. BodyWeight Training Cost: $2.99. This app provides its users with more than 200 video demonstrations of exercises that can be completed at home. The 10-week fitness program of half-hour workouts is based on the book You Are Your Own Gym by the military trainer Mark Lauren. A lot of doctors on Healthtap recommended this app. HealthTap This is a free app that lets you pose health questions to a network of 50,000 doctors licensed to practice medicine in the U. S. The Palo-Alto-based company received a second round of venture funding this spring from the high profile venture companies Khosla Ventures, the Mayfield Fund and Mohr Davidow Ventures. Users can pose short questions to the network on an anonymous basis. You can pay to speed up the response time by sending a “charitable donation” of $0.99 cents. But before that happens, you are shown a list of other previously-asked questions and answers that may answer your own. You can also use the app as your personal health record in that there’s a profile to fill out that lists your contact and insurance information, your medications, your allergies, the medical procedures you’ve had, your immunizations, and so forth. The app also helps users find doctors, look up symptoms, and find out about health conditions (what does it mean to be obese, technically, anyway?) It even features other doctor-recommended apps. iTriage Cost: Free. This app lets you look up symptoms by tapping on a naked avatar corresponding to your gender. I found this app to be overwhelming and clunky. For example, tapping on the lower back pulled up a menu of everything from “Backache or pain” to “Urinary retention.” Tapping on “Backache or pain,” gave me a massive list of potential ills that ranged from lumbago to a bladder infection to cancer. Tapping on low back pain (lumbago) provided me with a description of the problem, symptoms, potential tests and treatment. The experience was the equivalent of trying to figure out what the problem is myself by opening a medical encyclopedia. In other words, not very helpful. Goodrx Cost: Free. Goodrx helps you to comparison shop for your drugs through a mobile app. It provides coupons and discounts on those drugs. As the company says, it’s like an “Orbitz” for prescription drugs. Some of the prices listed for some of the drugs I use were lower than my current co-pay with insurance. Dosecast Cost: Free. If you’re taking a lot of different medications, this simple, elegant app is a neat way of scheduling your doses, keeping track of when you need a refill, and recording the prescription numbers all in one spot. Kids Doc Cost: $1.99. Anyone with a small child can relate to the experience of panicking and not knowing what to do when your child falls off the end of the bed and crashes loudly onto the floor, or when they suddenly develop a rash or a fever. The American Academy of Pediatrics developed an iPhone app called KidsDoc, where you can look up symptoms and then decide what to do based on a matrix of possible listed actions. It also provides dosage tables for common over-the-counter medications and first aid “topics” and illustrations. This would have saved me hours on the phone with nurses over the past four years. Both of these apps enable you to keep detailed logs of your baby feeding schedules, naps, and diaper changes. They also enable you to chart your child’s growth. Baby Health Record. Cost: $3.99 I balk at keeping a social security number in an app, but keeping the rest of my daughter’s information in one portable location instead of a paper file in my study appeals to me. This app is a file of all of her basic information, including her blood type, vaccinations, growth history, doctor and dentist appointments and medical history. Obviously, if you decide to use these and other health-related apps, it’s crucial to password-protect your device. One other interesting app that’s worth mentioning that wasn’t listed by either the IMS Institute or HealthTap: HomeTouch. It’s a system developed in the United Kingdom by a British dementia specialist that uses tablets to help the elderly and their family to stay on top of the parents’ care remotely. With all the horror stories of in-home nurses and nursing homes abusing or neglecting the elderly, this is an idea that’s definitely worth further exploration anywhere in the world.